Keep it short - People are busy, so make it easy for them to get through your email. Provide context - Remind them how they know you, or what your last interaction was. Be specific - What do you want to get out of this email? Avoid the temptation to soften your email ("just checking in...") and be specific about what you're asking for. - When to follow-up: After an interview - by the end of that day. Phone call/meeting/conference interaction - within 24 hours. Any time someone gives you their time, expertise, or advice, whether virtually or in-person, you should send a thank you email as a follow-up. It's a chance to express your gratitude, and continue to build the connection. Make it personal by mentioning something from your conversation that really stuck with you. End with a CTA on how you'd like to continue the conversation. Ex. "Please reach out if you have any questions or need anything else on my end." after an interview, or "I'd like to schedule a phone call to hear more about how you made the switch from account management to strategy." after a conference interaction. Hundreds of people might apply for the same position online, but only a small percentage of them will follow-up with an email (meaning that if you do, you'll automatically separate yourself as a candidate). Do your research on who to follow-up with, whether it's someone on the recruiting team, or someone on the team you're trying to join. Note that this is NOT an email to see whether they received your application. Use it to provide further context on you as a valuable candidate—include results from a recent project, specifics on why you're perfect for the role, or commentary on the company's latest work. Keeping up with your loose connections in your network is a highly underrated skill. Not only because you never know who may benefit your career in the future, but also because you'll build an outer circle of inspiring people in the industry. (This is also the scenario for keeping in touch with recruiters who liked you, but didn't have an open position.) Include any relevant updates—new work you've produced, recognition you received, or how you were able to use a piece of advice they gave. Include a question for them, but remember to make it specific—ask about something you talked about last time you spoke, or recent company news you saw in the trades. Avoid open-ended questions like, "How are you?" or "What's new with you?" as it often takes longer to answer. 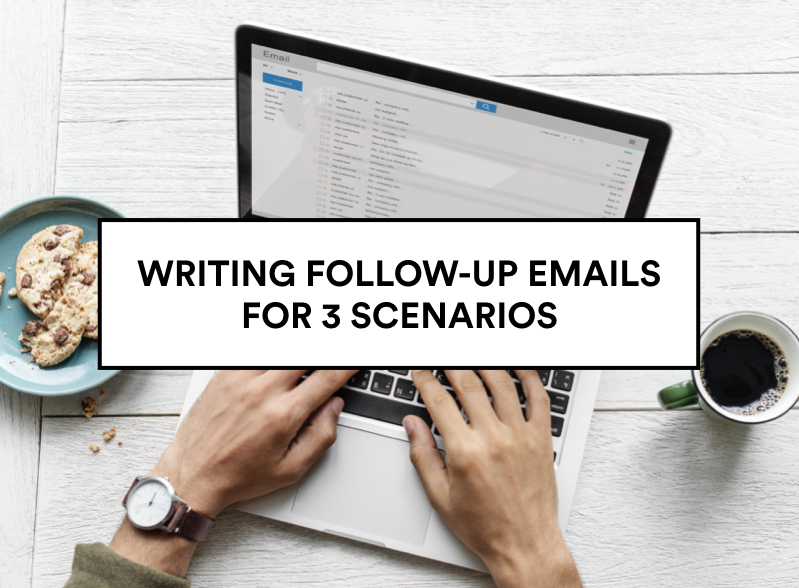 Two final tips: Avoid following up by phone (unless the person has explicitly stated that it's their preferred method of communication), and let it go after 2-3 follow-ups if you haven't gotten a response. There will be plenty of other opportunities for you to apply these tips and get what you want.